The open hatch of HMS Perseus, behind which lies an epic story. JOHN LIES ON A makeshift bed next to the torpedo-tubes and goes through his old letters. For him, as for other sailors, these are often the only way to keep in touch with the outside world. Almost directly above him is a circular escape hatch. The mood on the submarine is high. Positive messages are heard over the radio speakers. Yesterday its torpedoes had hit their target. John looks at a bottle of rum lying beside him, but takes only a small sip. The rest will be left for when they enter the port of Alexandria. Suddenly, a ghastly rumble is heard. The steel walls shake, and John is thrown onto the forward wall of the aft compartment. Everyone is yelling, electrical circuits are on fire, lights go out, panic takes over. It all happens fast, but John knows immediately what’s going on. They have struck a mine. John senses how the submarine is listing. The walls tremble and the rumble in his ears is water rushing into the sub. As the explosion occurred the vessel had been monitoring the action at the surface, with the conning-tower hatch open. When the desperate cries cease, only the grim rumbling is left. In a matter of seconds the heavily flooded Perseus plunges bow-first into the deep, carrying 61 sailors with it. One of the submarine’s torpedo-tubes. At 88m long, HMS Perseus (N36) was one of the largest submarines to take part in World War Two. She had been launched in 1929, was one of the first subs to be equipped with Mark VIII torpedoes, and had additional external welded fuel-tanks and gun-shield. With sister submarines of the same Parthian class – Proteus, Poseidon and Pandora – she had been stationed off China until Italy entered the war in June 1940. At this point Perseus headed to the Ionian Sea and under the command of Edward Christian Frederick Nicolay joined the 1st Submarine Flotilla. On 5 September, two of her torpedoes hit the Italian tanker Maya 5, and on 2 October in the Benghazi Canal she sank the merchant ship Castellon. Now at 10pm on 6 December, 1941 Perseus has been waiting for an Italian convoy to show up south of the largest Ionian island, Kefalonia. Clouds obscure the stars, and a freezing wind is blowing. John Capes is one of two “non-combatants” hitching a ride to Alexandria. 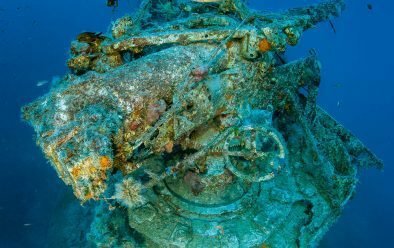 He had been the main stoker on the HMS/M Thrasher submarine, but some time ago in Malta his rented car had demolished a horse-drawn carriage and he had been back to sort the matter out. Now he was ready to rejoin the service, and had been ordered to accompany Perseus on her offensive mission and then carry on to Alexandria to rejoin Thrasher. 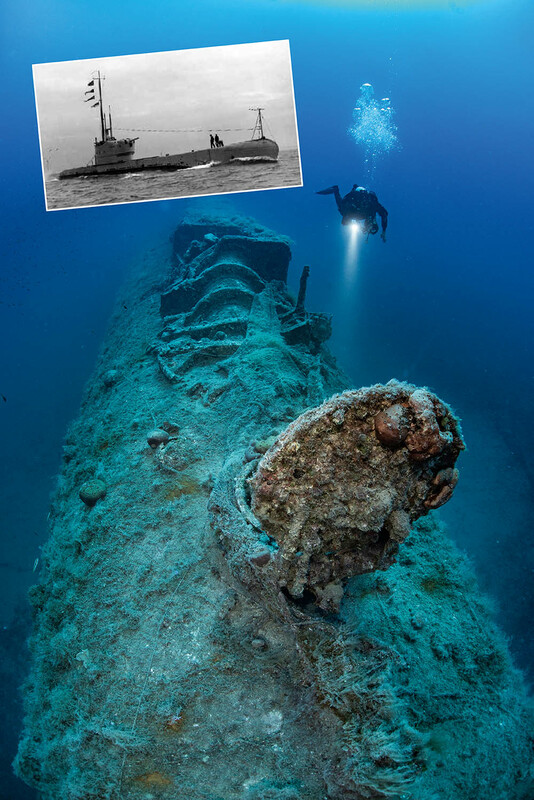 The other non-combatant was young Greek lieutenant Nikolaos Merlin, first officer on the submarine Glafkos currently in for repairs in Malta but travelling to take over a new submarine in Alexandria. So Perseus had left Malta on 26 November with 59 military crew and two passengers. THERE IS COMPLETE DARKNESS. For a few seconds the deafening murmur of the water seems to cease as John feels Perseus falling, then a devastating bump throws him back to the terrible reality. Perseus lies on the seabed but, by some miracle, the rear section has not yet flooded. John feels a sharp pain over his right thigh, but acts fast. He tries to snap on the flashlight that’s normally placed next to an emergency hatch, and it’s there and works! He heads for the engine-room, and the light beam slicing through the toxic air reveals a terrible sight. Everywhere is a tangle of burned and bloodied bodies, but somehow he finds three living though badly injured sailors. The door to the engine-room has been closed, not by human hands but by the explosion, but water is spraying through the rubber seal so it is clearly under heavy pressure. Helping the three injured men to the emergency escape hatch takes John half an hour. By now the water level has risen significantly and bodies are floating all around him. The cold penetrates the bones as the water goes on rising. Everyone is in the emergency room, but before the hatch can be opened the chamber must be flooded, because the surrounding water is now putting 10 tons of pressure on the hatch. What if the explosion has deformed the ship and the hatch won’t open? The men are kitted up in the Davis Apparatus, a simple oxygen rebreather consisting of breathing hose, oxygen bottle and a breathing bag. John checks the pressure gauge: it reads -82m. 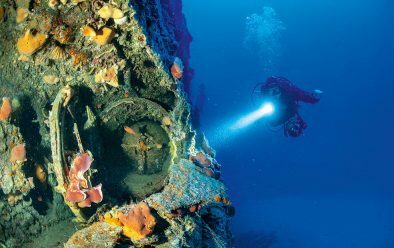 Their chances of survival appear to be zero, because a pure oxygen-supplying device is not designed to be used at such great depth, but there is no other option. The men put on the goggles and nose-clips to prevent leakage of gas from the loop. John finds a valve to equalise the pressure in the chamber, but the handle is bent. He needs to finds a solution fast, and realises that he has to flood the chamber using a system that sends smoke signals to the surface. When the oily water is swirling around them, the men all start breathing oxygen. The pressure equalises, leaving only a small amount of compressed air under the hatch-seal. In severe pain, John forces open the hatch and pushes the other sailors outside one by one before passing through the opening himself. The Davis apparatus carries him to the surface. He is breathing, but there is searing pain throughout his body. On his way up he finds himself next to another floating mine and, scared, he holds his breath for as long as he can. Finally, he reaches the surface and smells fresh air. He looks around for the other men amid the noxious bubbles escaping from the submarine, but it seems he is the only survivor. In the distance John can see the lights of what he believes to be Kefalonia. It takes him eight gruelling hours to swim some five miles before he falls exhausted on the beach. Good-hearted Greeks help him to recover in secret, as the island is under Italian occupation, and the Greek branch of MI9, the British Military Intelligence service, gets involved too. Eighteen months in hiding in various locations ends on the last day of May 1943, when John leaves Kefalonia on a ship named Evangelistria. THERE IS NO FIXED LINE anchored to the shipwreck. Descending along the makeshift reference line, we eagerly watch for the outlines of HMS Perseus to emerge. They become visible at a depth of 30m, but the real wow moment comes with a view of the conning tower in 40m. Deck-gun in front of the conning tower of HMS Perseus. The view of the bow says it all about the destructive power of the vessel. The torpedoes intended to destroy that Italian convoy are still in the chambers. From here the missiles that sank the Maya and Castellon were launched. With the perfect hydrodynamic shape of the ship in my viewfinder, the damped noise of the engines and sonar almost seem audible. Although the sheathing slowly breaks down, the body of the submarine remains in perfect condition, the escape hatch still the only way in and out. 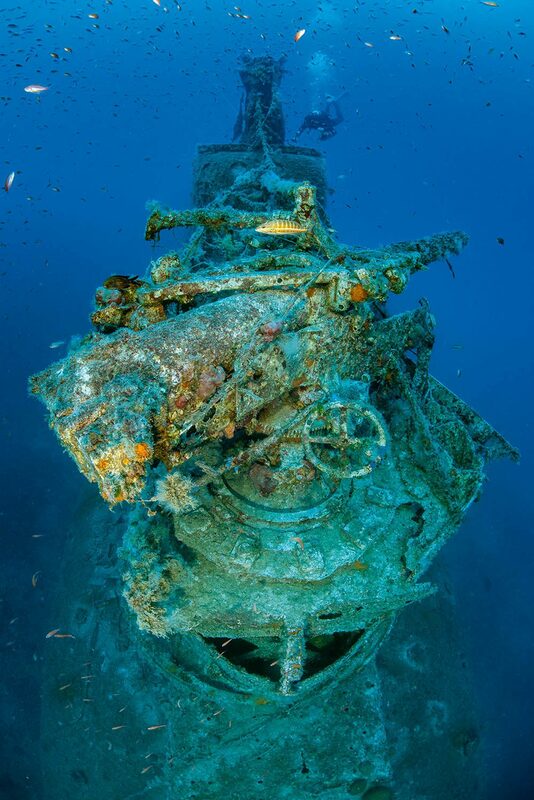 The Perseus had not been at 82m, however – that had been the reading of a broken pressure gauge. 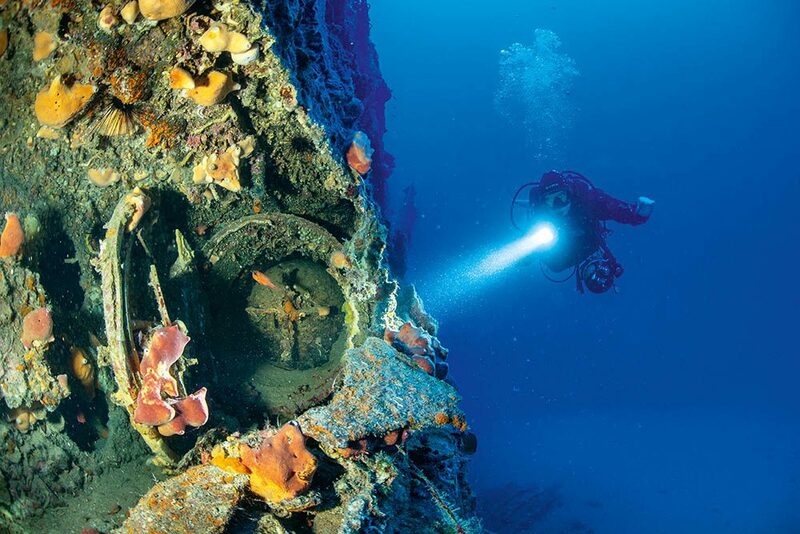 The wreck lay at 47m, still way too deep to be breathing pure oxygen. How John had survived breathing from Davis apparatus at such a depth is a mystery. _One theory has it that the air in the flooded chamber was already so lean on oxygen that it took a few minutes for John to saturate himself. _Another suggestion is that because John was a smoker and smoked in the engine-room during the collision, his haemoglobin was partially saturated with carbon dioxide, giving him more time. _Was it John’s will and the desire to live that saved his life? Whatever it was, by his heroic action he earned not only a medal but his life – he lived to be 75.